One of the first decisions to make is how files will be identified. Clients or accounts can be indexed by name, or by an assigned account number. For small to mid-sized systems, accounts can simply be identified by the name of a person or business. Large filing systems generally use numeric indexing because the risk of misfiled records is minimized. Often clients or accounts already have an assigned number in a computer database that can be used as the identifying number for the files. 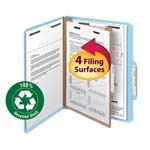 Many account filing systems can use standard file folders or hanging folders. New documents are routinely added as regular transactions are made. If a specific sequence of documents is needed, use a Fastener Folder product as the Keeper. Fasteners also help divide documents into categories. 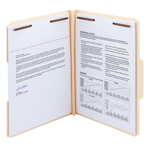 Hanging folder systems can use Interior Folders to break down papers into groups, such as different policies for an individual at an insurance agency. In general, end-tab shelf filing systems are the easiest to use, save the most space and are the least expensive to set up and maintain. 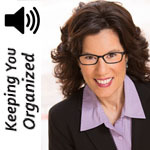 However, if your total number of records is relatively small, traditional drawer filing cabinets located near people’s workstations may be the right choice. 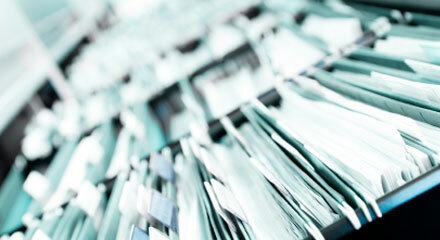 Smead Organomics offers a variety of filing solutions for client or account records. Choose the Team Organomics button to find out which one is best for your business. If you need more help, consult your office supplier or request a free onsite analysis by a Smead professional.